I’ve been experimenting with different ways to make the PokemonGo hats. Iron on transfers are okay; spray on fabric paint however was not. After letting the paint dry then washing per instructions, the paint faded. I really liked the color too! 😦 Next up I will experiment with embroidering the hats instead. Instead of the traditional star or angel at the top of the tree, I wanted to do something different. I decided to make our tree an awesome top hat – like a sir! I made the top hat out of burlap lined with cardboard to make it real stiff. I used a mixture of sewing and hot glue. 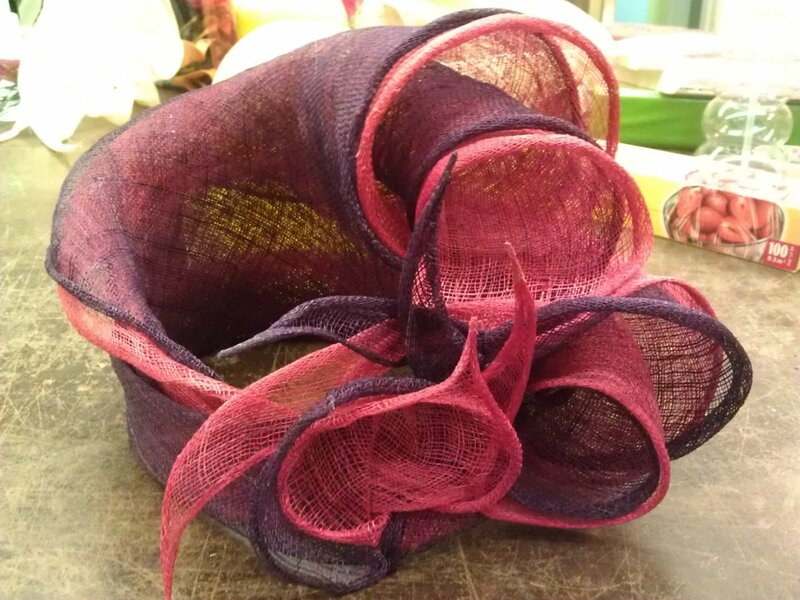 Today was the last millinery class :[ but at least I finished all my hats and some! I blocked a felt hood. When I started out I wanted a top hat but the opening was too big and wouldn’t shrink in so I ended up with this. I also blocked my straw hat. 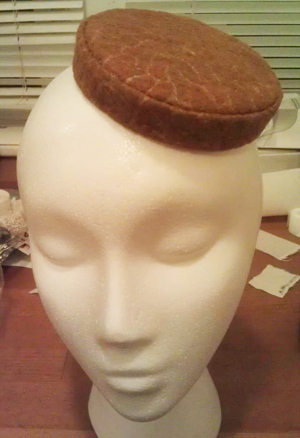 Today in class we worked on sculpting a hat with our sinamay. 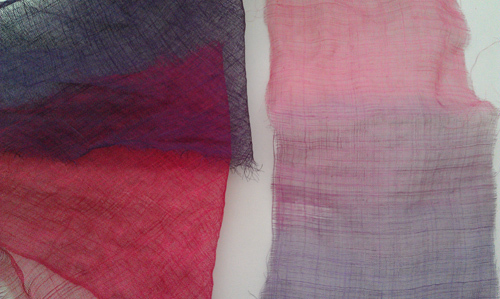 I used the sinamay I dyed. 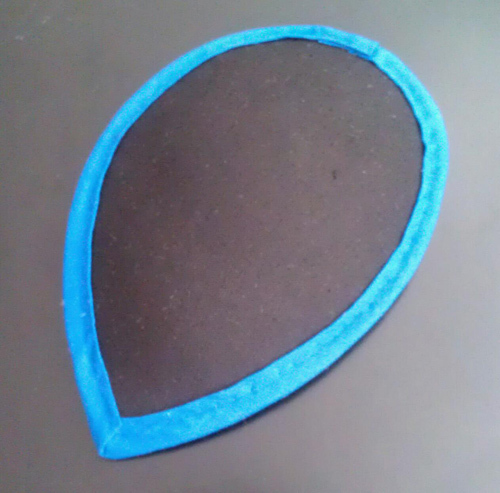 Before dying, It was one big square that I cut along the bias to make two triangle pieces. So the idea was to pin it to your head block and start playing around with it. First things first. You can either roll the edges for a clean look or unravel them for a more wilder look. I decided to roll them. It took a good while and made my thumbs hurt, but it was worth it. Then I put my two pieces together and folded them in half to create a band to go around the head. I then pinned it around my head block. I had both ends sticking out and decided to twist them around and created something that reminds me of a flower. Now I have these big pieces to play around with and figure out what I think looks best. I kept changing the sides and re-pinning the pieces since I didn’t like the way it came out the first time. The first time I had the pieces curve on both sides, didn’t like it, so I took all the pins out and decided to move it all to one side. 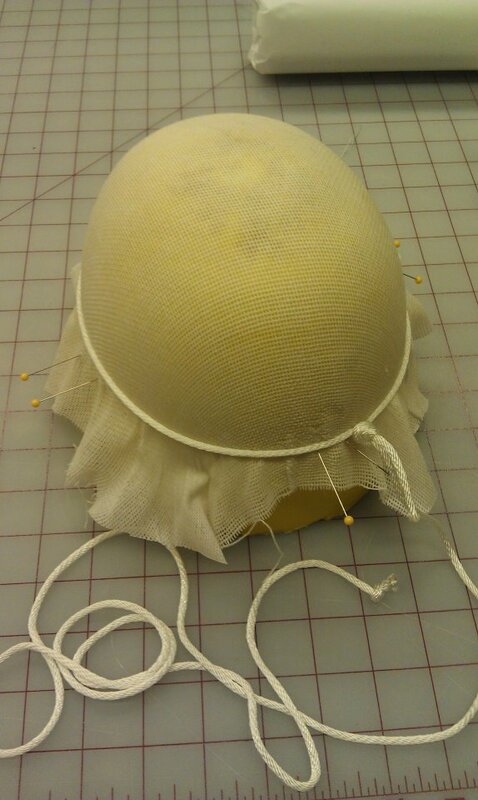 The last step is tacking where all the pins are with thread so all the pieces stay in place. 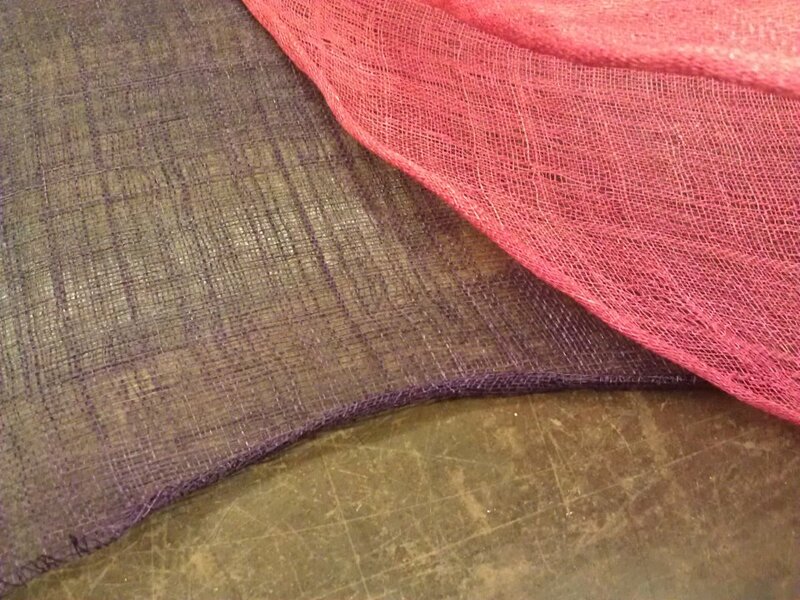 all pieces are tacked – ready to wear! I had a small piece left over and sculpted a little head piece. I’m either going to put it on a headband or put a comb on it. 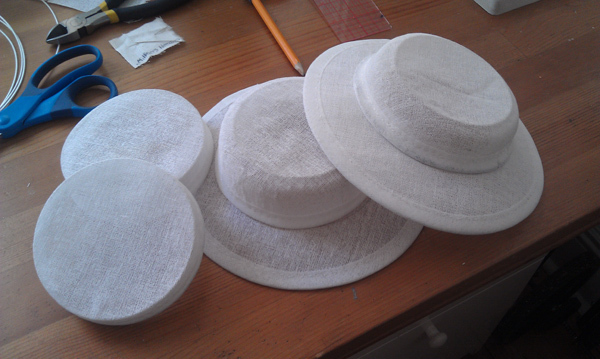 All last week I made some mini hat and pillbox frames by blocking buckram. 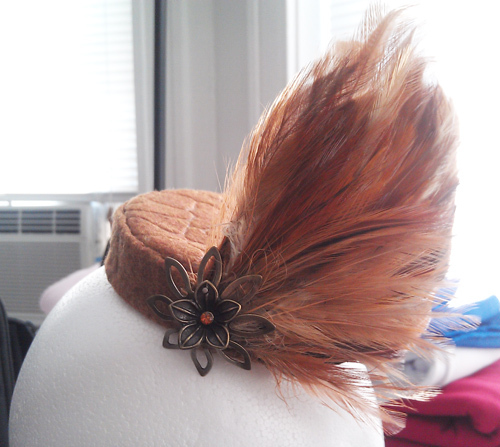 I plan to make one of the brimmed hats into a tricorn hat, if not both. I just need some trim for the outside of the brim. I covered one of the pillbox hats and it’s nearly complete. I just need to permanently attach the flower pendant. Remember the cocktail hat frame from last time? It’s finally covered. I didn’t get to work on more flowers in class, but I plan on making smaller ones to put on this. 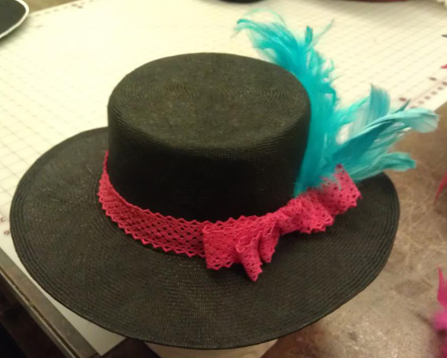 I also wired the crown for the fedora but I feel I made it too short.. but I still need to make the brim. 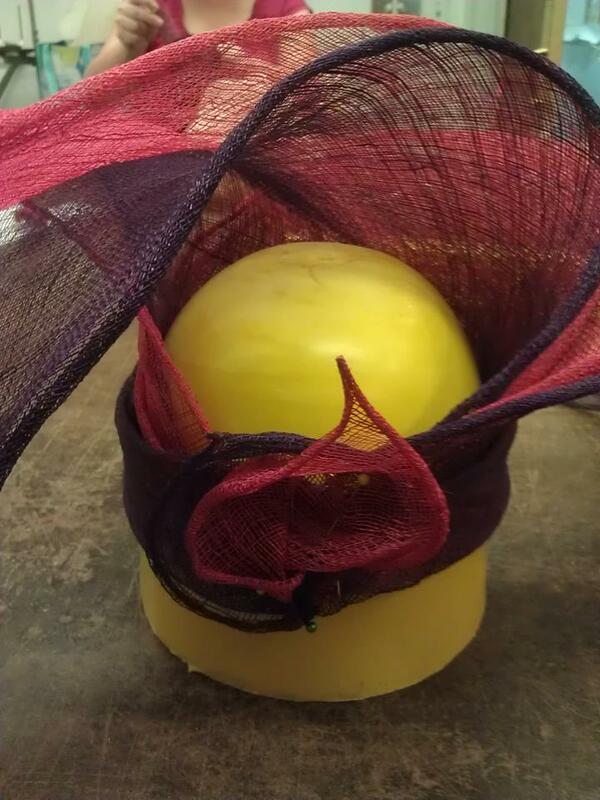 Next week we will finally be sculpting a hat with sinamay. The teacher gave us a natural colored piece and I decided to dye mine. 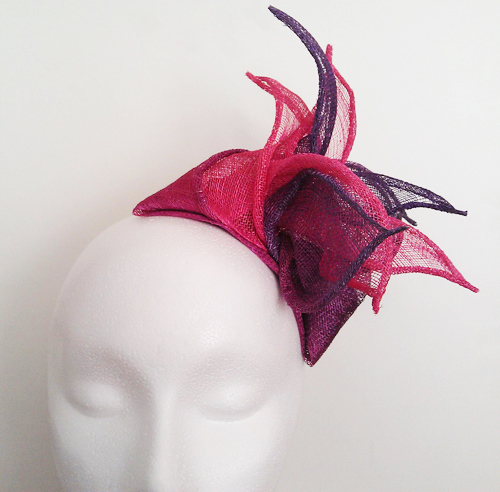 I want to use two different colors together – makes it more interesting. I used RIT powdered dye. To get the nice rich darker colors I used dying directions I found online and combined them with the RIT dye directions. Directions can be found here. Today we learned how to use the french flower making tools. It was quite interesting. Putting the flower together however was a bit frustrating. My pedals kept falling off because the glue wasn’t holding very well. I also don’t think I really like the way the flower looks. Maybe because it’s too big or maybe I should have made the petals curve outward more. Oh well. I’ll keep doing it until I get it right – and make them smaller. After all, this is what is going on the cocktail hat. We have a bunch of different projects going on at once. 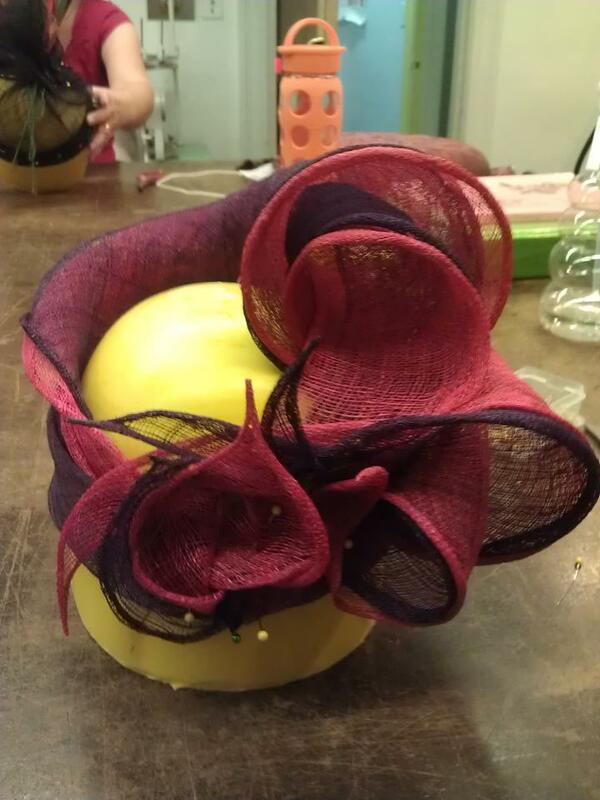 Next week we can continue our flowers and we will also start sculpting a hat with sinamay. Down the road we also will be blocking straw and wool felt hats. 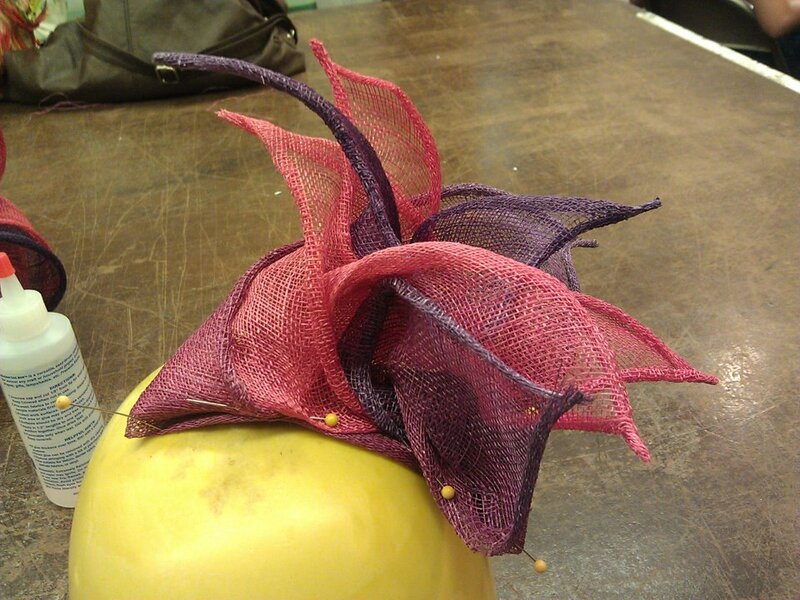 I’m taking a millinery class this summer and it started last week. I’m pretty excited! 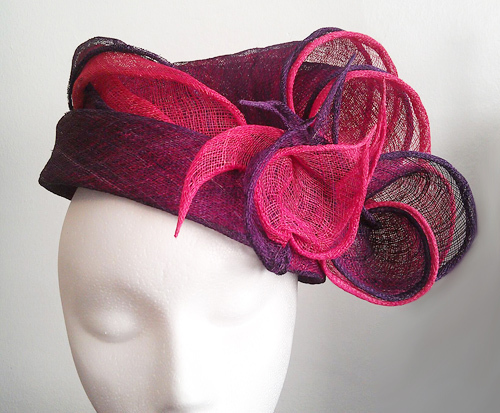 I really want to learn and have experience making real hats. Yesterday I learned to block with buckram. We’re going to make little cocktail hat and learn French flower making. Now I just need to pick out what fabric I want to cover the buckram with and what shape I want to make it! Decisions, decisions..
We only got this far since we had to wait for them to dry.